The final village that we stayed in on our 4 day Dogon Country trek was the village of Benimatou. Benimatou is spectacular for a few reasons, many of which I wasn’t able to capture during our short stay there. For one, it differed from most Dogon villages in that it contained not only Muslims, but Christians and Animists as well. Most of the other villages we saw were entirely Muslim, having converted to Islam in the past couple centuries. Benimatou had all three religions. Another reason Benimatou is amazing, is its location on top of the escarpment, looking over onto the immense vista of a never-ending valley floor. In addition, there were giant red rock formations jutting up in every direction, reminding me of the American Southwest. On the night we stayed there, we were lucky to witness some sort of Christian ceremony. It happened to take place directly behind our campement where their church was located. There was drumming and singing from far away, and it came closer and closer. Soon we saw a procession of people heading toward the church. The only problem was that there were about six camping tents blocking the entrance- tents belonging to Dutch tourists. But it was barely a hindrance as they simply picked up the tents and placed them aside. They all packed into their small mud church and we could hear muffled music, and what was probably a sermon. Afterward they reemerged and began dancing in a circle, a type of line dance, musicians on the sides. The music and singing was captivating, and while others in our group tried to sleep, I attempted to record it with my phone. The next morning I asked our guide what happened last night, and he said – “Oh they’re just practicing some Christmas songs for the upcoming holiday”. Wow, I thought. I want those to be our Christmas songs! As we trekked along the valley trail that followed the line of the escarpment in Dogon Country, there would be various cliff dwellings, the grandest depicted in the previous sketch of Tele. This one at Endé, though smaller and less complex, had a simple beauty as it faded into the red cliff. Some of us ventured up to explore the dwellings, others napped and enjoyed this amazing scenery. I took the time to sketch and do this watercolor, because I had a feeling we might not see this type of cliff dwelling again. We stayed at a campement, a rustic gueshouse, in the village of Endewo in Dogon Country. The drawing to the left is of a typical granary, made of mud with a straw roof, where a particular family (this one might belong to the wife) will store their grains. Inside there are various compartments for different types of grains. On the right, I drew one of the buildings at the campement we stayed at called Oumar Lagan, it was made in the style of a common dogon house, with carved wooden doors and a multitude of alcoves to put statues and other items in. I never got the full story on the purpose of the alcoves, but they seemed to be decorative. This drawing marks the start of our trek in the Dogon Country. The Dogon Country is known for its cliff dwellings, mud villages and granaries with straw roofs all inhabited by the Dogon people. It follows along an escarpment, or cliff that runs for appx. 250 km. The Dogon Country is a popular tourist destination, though when we were there we did not see a huge amount of other tourists. We hired a guide, and were part of a group of ten. Each day we would trek with our packs and see 3-10 different villages, some situated on the valley floor, some like this in the cliff. For the most part, however, the cliff dwellings are no longer inhabited, as most people work in the fields in the valley. The Telem people were the first to inhabit the cliffs, and built amazing dwellings into little alcoves, sealing them in with mud. They seem impossible to access. But what we don’t see anymore are the lush cascading vines that used to cover the escarpment, providing both shade and a means to climb into the dwellings. In fact the valley floor used to be a thick forest, and so living up in the cliff was a safer alternative. We made our way from Kayes to Bamako, and then from Bamako to Segou, Segou to Djenne. I’ll spare the details of the bus rides, except to say they were hot, unventilated and included a heated shouting match between passengers and the driver. We arrived in Djenne on Sunday, and were able to see the popular Monday market that takes place in the dramatic location in front of the mud mosque. The mosque is known as the largest mud mosque in the world, and the entire town of Djenne is a Unesco World Heritage site, which means its mud housing is largely preserved. I was originally going to draw on a rooftop to the side of the mosque, but realized it would be way too hot with the sun beating down on me. So Maya was able to talk to a stall owner in Fula and get us permission to sit alongside his stall with this great view of the mosque. The market was pretty crazy, and the heat limited me to one drawing in this spot. 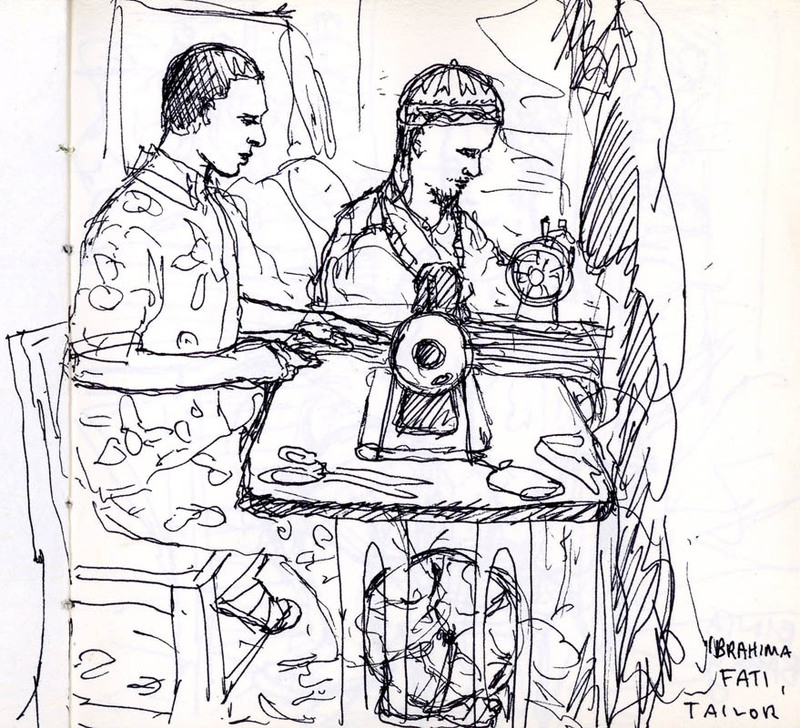 We visited Maya’s tailor, whose name is Ibrahima Fati, while in Kolda. Earlier, we had bought some bright green & blue patterned Senegalese fabric. We brought it to Ibu to sew an outfit that would be a gift for a small child. He had a wonderful old sewing machine with a foot pump, and he worked outside under the overhang of a building alongside the marketplace. Maya has had several full, traditional Senegalese outfits made by Ibu, only a couple of which she has kept. He was a wonderfully friendly and gracious man, and he let me sketch him and his tailor friend. 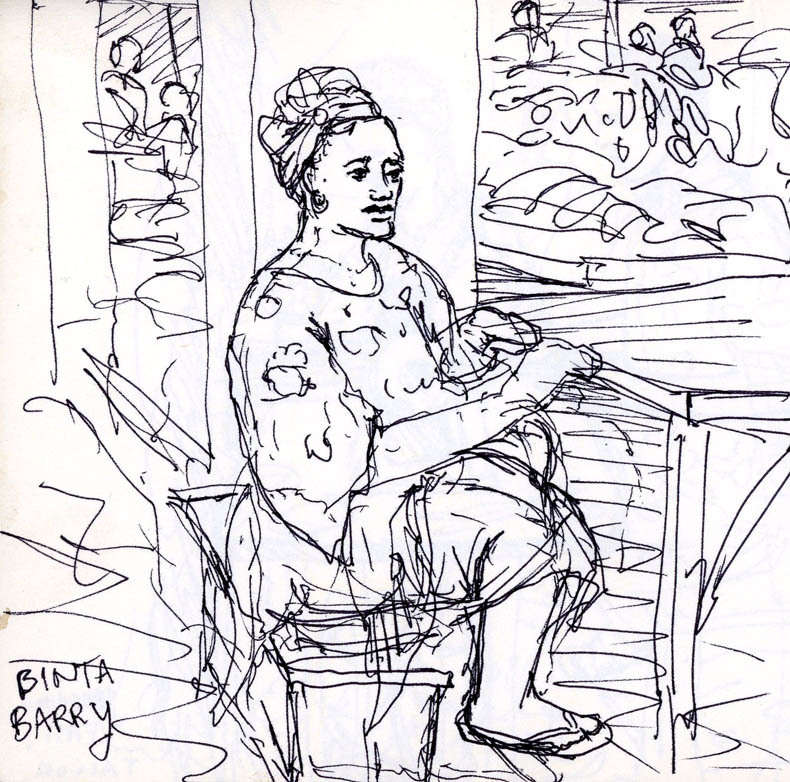 In the same spot, I sketched a woman named Binta Barry, below. We did not know her, but she let me draw her, though she became somewhat self-conscious. She was wearing a beautiful dark blue top and skirt, with matching headdress. I wish I had had time to draw the pattern on the fabric.